From 1 to 5 Vans on the Road in Less Than 2 Years! Basement Pumps Limited is a fast growing all pump service solution to residential and commercial clients based in the South East of England. Over the past year and a half, the business has grown exponentially, starting with just one van on the road to a fleet of 5 vans in less than 2 years. We spoke to Rick Peacock, Director of Basement Pumps Limited, to get his insights on how it happened for them and how other forward-looking companies can do the same. I started three years ago as a sole trader. 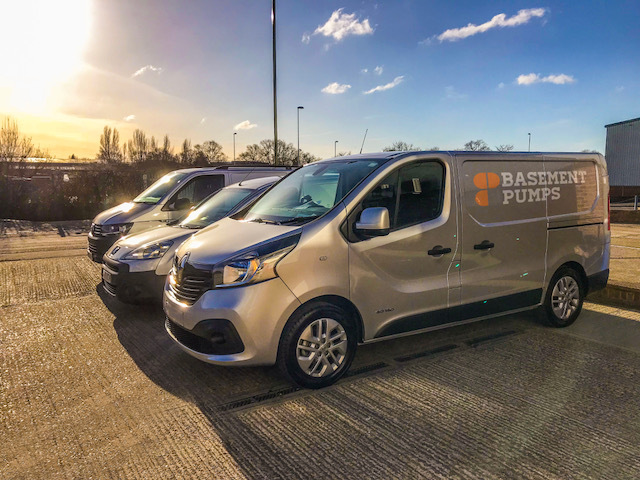 We’ve been trading for three years as Basement Pumps Limited and now have five fully equipped pump and drainage vans on the road and five pump engineers. We started off with one engineer for a year and a half and have employed another four people within the last twelve months alone. We’ve just been growing and growing! What allowed you to grow as a company? Our main priority is excellent customer service and I think this is one of the key things driving our growth. We’ve always put our customers first and, as a result, have built some really good relationships. Our customers say that it’s the one-to-one attention we provide that they really value and has led to a lot of our work coming in through word of mouth. We always arrive at callouts in good time. This is especially important when it comes to 24h emergency response times and has helped build our reputation. How do you manage your workforce and the jobs that come in throughout the day? Just over a year ago we started using Okappy to help keep on top of our work and streamline our operations. We work with another drainage company; Convert Water Ltd who introduced us to the system. Before Okappy, we were using paper-based job sheets and scanners. It was getting ridiculous. I’d come in from work after a 12 or 15 hour day and would have to sit there to send and edit all the job sheets and reports. Now, with Okappy, all the job information gets sent straight back to the office. Within 20 minutes of the job being completed, the customers can see their completed service sheet and invoice. It means I don’t have to make unnecessary trips back to the office and instead I can just go home. Having a healthier work-life balance has meant I’m more productive and the work I do is of better quality. Through using Okappy I can truly focus on meeting my customers’ needs. What has happened since implementation? The main thing we’ve gained from Okappy is time. I easily save 2 hours a day (previously spent sifting through paperwork). This adds up to over a day of work a week if you think about it! We went from 1 to 5 vans in under 2 years. We now have a warehouse and sell pump chambers, pumps, alarms and other supplies. Customer service and collaboration have always come first and so we must have been doing something right! What’s your advice on people making the jump from paperwork to digital? Many companies are apprehensive about using a new system, but once you make the jump you don’t look back. Okappy is a lot easier than you might think. All our engineers picked it up quickly and easily. It also made their lives easier. You can send the job sheet off and the customer gets the report within seconds of doing so. It’s very simple and quite self-explanatory. We’re seeing a lot more collaboration in the industry with the use of multiple subcontractors for any one job. Okappy has a networked approach to job management meaning there is less duplication of information between the companies involved in the work. Using a networked system is great as you can add jobs and send them to your subcontractors and view the latest status of the job as it’s updated. If you’re a company that values customer satisfaction as much as we do, then Okappy is great. They really understand that too. You can even invite your customers onto the system and let them add and view their jobs themselves. Okappy are happy to offer demonstrations and training to companies who want to understand the latest way of working, and there’s no pressure to commit to anything straight away. They also offer a lot of help and support in different formats including video tutorials on their YouTube channel, forums and support articles. So you can give yourself a crash course in your own time and in a way that you’re most comfortable with.